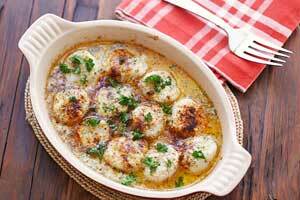 Broiled scallops are coated in butter and Parmesan and broiled until wonderfully crispy and flavorful. I really like this easy recipe for broiled scallops. The scallops recipe I make most often is baked scallops. But when I want something truly easy and fast, broiled scallops are the answer. Absolutely! Coated in melted butter, then dipped in seasoned Parmesan, these broiled scallops need just a few minutes under the broiler to achieve a perfect golden crust. I add quite a bit of cayenne pepper to the coating. It adds a lot of flavor and just a hint of heat. I don’t want to overpower the delicate flavor of the scallops. There’s no need to add breadcrumbs to the coating. Grated Parmesan adheres to the scallops just fine! And this way I can keep the broiled scallops low carb and gluten free. There’s also no need to turn the scallops midway through broiling. Simply broil them until done. The top will crisp up and the rest of the scallop will be nice and tender. How do you know when scallops are done? Yes, they are. Scallops are a good source of protein, magnesium and potassium. It’s true that in this recipe they are cooked with butter and parmesan. But recent research tells us that for most healthy people dairy fat is harmless, and might even be beneficial. It’s also true that this recipe is high in sodium. But that too is not necessarily a bad thing. Though you should make your own decision of course based on your own health and the recommendations of your physician. You can serve them as an appetizer. But I often serve them as a main course, alongside buttered zucchini noodles or creamed spinach. As a general rule, cooked scallops should last in the fridge, in an airtight container, for up to 3 days. They never last that long in my house though! Reheat them in the microwave, very gently, on 50% power. 2 lb. extra large sea scallops, 12-16 per lb. Line a rimmed baking sheet with foil for easy cleanup. Fit the baking sheet with a roasting rack (I use a cooling rack) and spray the rack with avocado oil. Place an oven rack 6 inches below the heating element (usually this means the second rack from the very top of the oven), then heat the broiler on high (500 degrees F). In a shallow bowl, mix the grated Parmesan with the salt (if using), black pepper, garlic powder and cayenne pepper. Place the melted butter in another shallow bowl. Rinse the scallops and pat dry with paper towels. If they have a small, crescent-shaped muscle attached to their side, use your fingers to remove it (it gets tough when cooked). Dip each scallop in the melted butter, then dredge it in the Parmesan mixture, turning to coat. Place the coated scallops on the prepared roasting rack. Lightly spray with avocado oil. Broil, 6 inches from the heating element, until cheese is golden brown and scallops are cooked through - white and moist in the middle - 6-10 minutes. Exactly how long to broil will depend on the size of the scallops. I used colossal scallops - there were 13 per lb. - and they needed 10 minutes under the broiler. Start checking after 6 minutes. There's no need to turn the scallops, but do rotate the baking sheet midway through broiling. Serve the broiled scallops immediately. Omitting the salt reduces the sodium per serving to 986 mg.